The Samsung Galaxy Tab S4 is a 10.5-inch premium tablet. Its highlights are a high-resolution Super AMOLED display, a fast processor, and Android 8.1 Oreo. Additionally, it offers interesting accessories like the S Pen stylus and a keyboard cover. Samsung is marketing the Galaxy Tab S4 as a productivity tablet. However, it should be great for entertainment too. Here is everything you need to know including full specifications, videos, comparisons and more. The Samsung Galaxy Tab S4 is a 10.5-inch premium tablet that was announced in August 2018. Like its predecessor, it features a glass back and front and a metal frame. So, while it’s not a full metal body, it feels very high-end and elegant. However, I think you will be able to see fingerprints fast. You can get it in black and grey. Like an iPad Pro, the tablet features four speakers in total. They are developed together with AKG. In addition to that, there is a USB 3.1 type C port integrated into the metal frame, as well as a microSD card slot. Unlike its predecessors, there are no hardware buttons underneath the screen. So, you will be navigating using the touchscreen only. Yes, that means there is no fingerprint sensor anymore. The Samsung Galaxy Tab S4 is one of the few tablets with a Super AMOLED display. It measures 10.5-inches and has an aspect ratio of 16:10. The AMOLED screen has a very high resolution of 2560 x 1600 pixels. While the display seems to be outstanding, the internal hardware is about a year old already. Samsung is using a Qualcomm Snapdragon 835 octa-core processor which we started to see in phones in 2017 already. However, it is not as bad as it sounds. Most tablet manufacturers use older chips in their devices. So, the Galaxy Tab S4 should still be the fasted Android tablet for a while. Other specs include 4GB of RAM, a 64GB eMMC flash storage and optional LTE and GPS. It features Wi-Fi ac and Bluetooth 5.0. Samsung is shipping the Galaxy Tab S4 with an S Pen. While it works similar to the Galaxy Note lineup, this stylus is thicker and easier to hold for longer writing and drawing sessions. Just like the Surface Pen, the S Pen supports 4096 levels of pressure sensitivity. There are a lot of software features integrated into the tablet to support the pen. For example, there is a special notes apps, handwriting recognition, and a drawing app. You can use the pen to take screenshots, translate texts, and do some math. Another special feature is that you can write on the screen even when it is turned off. Another accessory is a keyboard cover which Samsung is calling Book Cover Keyboard. While the pen comes with the Galaxy Tab S4, you have to buy the keyboard separately. Obviously, you can use any Bluetooth keyboard with this tablet. However, it has a pin connector on the side. Using that, you can connect the official keyboard without having to charge it separately. The Samsung Galaxy Tab S4 is one of the first tablets to ship with Android 8.1 Oreo. Compared to most competitors, this tablet has a huge advantage. In the past, Samsung was much quicker with updates for their tablets and they provided software updates much longer. I am expecting the Galaxy Tab S4 to get Android 9.0 Pie and even Android 10.0 in the future. Android 8.1 Oreo is topped with the Samsung Experience UI. That is the own interface from Samsung that was previously called TouchWiz. Even though that UI customizes Android quite heavily, it is not as bad as before. In fact, the customizations make sense and I think the Samsung Experience UI is good enough for most. Do you want to know more about the Samsung Galaxy Tab S4? Here are a couple of videos I think you’ll enjoy. And, you should watch them if you are interested in buying this tablet. There are a lot of interesting alternatives to the Samsung Galaxy Tab S4. Obviously, if you don’t need the newest out there, you could check out the Samsung Galaxy Tab S3 (review). While it is a year old already, it has a lot of similar features to the Tab S4. I think it is good enough for most and it even has a fingerprint scanner. Another tablet you might want to compare is the Huawei MediaPad M5 Pro. In fact, both tablets are very similar and they both feature an active pen. However, while the MediaPad M5 Pro has a high-resolution screen as well, it is an IPS display only. You will be able to save quite a lot of money but the M5 Pro won’t look as nice as the Tab S4. If you want to save a lot of money, you should also check out the new Samsung Galaxy Tab A 10.5. While it is much slower and not as premium-feeling, it is much cheaper too. 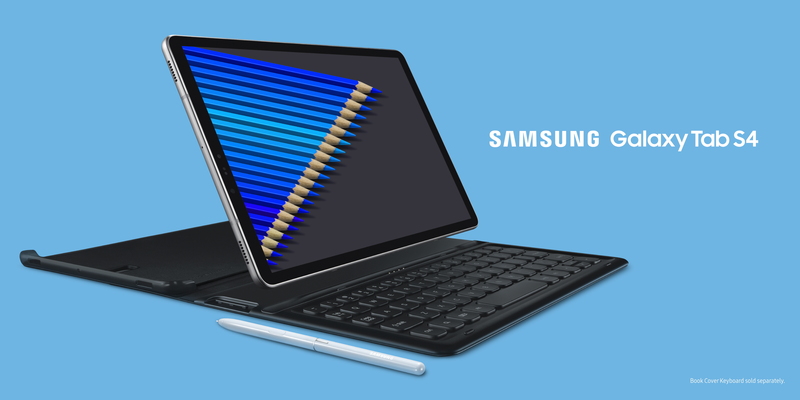 Samsung announced the Samsung Galaxy Tab S4 in August 2018 and it already is available in the United States and Europe. Other countries, especially Asian ones like Thailand, Taiwan, and India, should follow soon. Prices start at 649 US Dollars in the United States. In most parts of the world, it will cost the same converted into your currencies. However, in Europe, it is a bit pricier with a starting price of 699 Euros.